There are four main types of shades today are honeycomb shades, Roman shades, woven wood shades and the traditional window shades. There are unlimited choices of fabrics, textures and opacity. All offer varying degrees of light control and privacy. With the vast array of fabrics and materials to choose from, there is a window shade to suit almost any room in the home. The privacy and light control needs for the room will dictate which of the many fabrics you can choose from. The more sheer fabric can filter light and the opaque can darken the room. Fabric texture options with window shades can accommodate formal looks to casual looks and anything in between, making these products popular for any room and its decor. 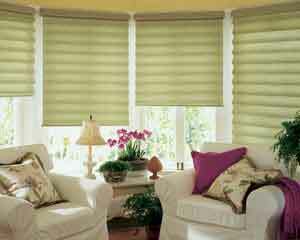 The honeycomb construction of these soft yet durable shades makes them highly energy efficient. Choose from a wide variety of sheer, semi-sheer, semi-opaque and opaque fabrics, as well as hundreds of colors. If energy efficiency is a concern, honeycomb shades should be considered. The honeycomb cell construction traps the air inside for maximum energy savings. They can fit almost any window, including specialty shapes and stack neatly out of view with minimal space at the top of the window when raised. Roman shades are available in many styles. They are available in various types of fabric ranging from smooth semi-sheer polyesters to highly textured semi-opaque polyester/rayon blends and also in room darkening fabrics. Woven wood shades are probably our most popular and versatile category of window coverings. Made up of bamboo, reeds, grasses and jutes, adding warmth and dimension to a room. Woven wood shades bring nature inside the home with traditional styling. These shades work well in any room. 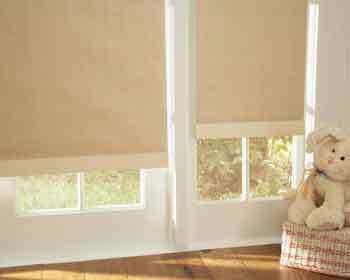 Today’s roller shades are a vast improvement to the traditional roller shade. From blackout to light filtering they are appropriate for indoor as well as outdoor applications.